The Biodex Fall Risk Screening & Conditioning Program is based on well-established science and uses technology to create an objective and efficient program. Modifying the factors that lead to falls will increase mobility and confidence, both critical to maintaining personal independence. The program is a simple combination of risk-factor screening including analytical balance testing in conjunction with universally accepted normative data and medical protocols. If a patient is found to be at risk of falling, we have an array of interventions and exercises that can help restore balance and reduce the risk. Intervention is supported by patient education and exercise plans. The Balance System SD can identify a potential problem in just two minutes. The Biodex Fall Risk protocol of balance exercise will improve an individual’s ability to remain upright under challenging conditions. In the United States one in three people aged 65 years and older fall each year with the rates steadily increasing as age increases. As a physician, you know falls are one of the greatest causes of serious health problems for older adults. 25% of patients over the age of 65 with hip fractures die within six months, 25% will lose significant function, and 50% experience a decrease in mobility. Modifying the factors that lead to falls will increase mobility and confidence, both critical to maintaining a more independent life style. Studies show that balance training, gait, strength and flexibility training not only improve mobility, but also help reduce the risk of falling. Three areas proven important in assessing your patients’ risk of falling will be addressed in this program. Strength is a critical factor for a rapid response to a balance disturbance. 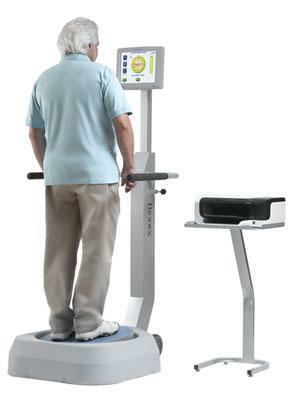 Testing will identify weakness and, if necessary, exercise will significantly improve lower body strength. As you know, normal balance is controlled by a complex combination of visual, muscular and neurologic systems. Together, these factors keep us from falling when we encounter an unexpected disturbance. Testing and appropriate exercise will improve an individual’s ability to remain upright under challenging conditions. Older adults typically display a slower walking speed. Steps are also shorter and vary in length. These are all factors related to falls. Independence is directly related to walking speed. 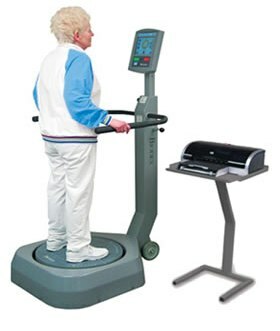 Testing and, if necessary, exercise helps your patient learn how to walk more safely and confidently. A structured program that consists of eight visits over a four-week period. The patient is evaluated for specific risk factors known to contribute to falling and decreased mobility. The test results from the evaluation are reviewed with your patient. We will advise your patient if they are at risk of falling due to physical limitation such as strength and/or balance. If the cause is physical, we will plan an exercise program for your patient’s individual needs. We will also help them identify and eliminate environmental factors that they may find at home or in their community. Exercise targeted to improve strength, balance, walking speed, step length, flexibility and cardiovascular fitness. Instruction for simple exercises that can be done at home will be suggested. A report is provided to you and your patient summarizing the effect of the four week program.